When you work in UX, you live and die by user research. If a business owner requests a specific feature, the UX designer is typically the one to ask “how would our audience benefit?” and if you build something that users asked for, you’re typically in the clear. But sometimes users say they want one thing, and their actions show they needed something else. Given the stigma around mental health care, and how difficult it can be to find care, the risk in this field is even greater. A quick look at the (literally) hundreds of mental health-related apps in the app store shows that designers also don’t know what users need to improve their mental health. It’s time for designers to learn from mental health care providers. On one of the first user interviews I ever watched, a potential site customer looked at the homepage and said “I don’t like how these buttons are set up. It says ‘Get Started,’ but I don’t think I would want to do that until I knew more about them.” The user then read one more sentence on the homepage and promptly clicked on the Get Started button. My team captured it on video, and for years used the clip as an example of the fact that what a person says and what they do can be two different things. When it comes to healthcare, plenty of people struggle to make decisions that will benefit them. Someone with a sprained ankle may procrastinate or even avoid doing exercises that they know will help them heal faster. Someone with diabetes may know that eating sweets can result in losing a foot, but making that decision in the abstract is a lot different from making it in the moment. When someone has a mental illness, that struggle increases substantially. Lack of motivation is not just a challenge; it’s a symptom of depression and other mental illnesses. Behavioral health therapists, social workers, psychiatrists, and psychologists use techniques and therapies that help their patients overcome that and other symptoms to treat mental illnesses. But most designers don’t have access to healthcare providers to share those treatments and therapies. Plus, even when they are handed the right information, the transition from in-person treatment to digital therapist is not a perfect transition. Within the field of UX, there are behavior change analysts and behavioral psychologists. These are designers or researchers with medical backgrounds, who study the reasons people make the decisions they do. At companies like Mad*Pow (where I work), they are often involved in building digital interventions and medical apps that encourage people to make decisions that benefit them. The behavior change analysts help translate in-person therapies into digital. They work with content strategists to identify appropriate language, and with UX designers to create interventions that support patient needs. The clinicians wished they had a way to know which apps were tested and verified to be safe for their patients. The designers wished there were some sort of definitive strategies and assessments to determine if their apps were working. What the designers didn’t seem to know is that there are strategies and assessments to determine if a patient’s mental health is improving. Clinicians use them every day. But these aren’t well popularized to designers in a way they can use. And there certainly isn’t a system to then evaluate the apps for patient safety. The FDA has regulations for apps being prescribed medically and includes clinical testing, but that is not a requirement for uploading an app to the App Store. With all that in mind, my team has created a set of guidelines for UX designers building apps in the mental health space. These guidelines have been validated by multiple practicing clinicians, medical researchers, UX designers, and behavior change analysts. If you follow them, you’ll be taking the first step toward designing apps that benefit patients and earning clinician trust. The six guidelines are easy to remember because they spell HEALTH. Apps are a great addition to mental health treatment, but no app is enough on its own. This is true in the same way that a therapist alone or a medication alone is not enough to “cure” someone of a mental illness. With that in mind, an app designed to benefit someone struggling with mental illness needs to have a human aspect. It should have some method for connecting to a therapist or support system when the user is feeling suicidal or having an emergency situation, and it should provide social support wherever possible. Social support is proven to increase motivation. There’s no reason to reinvent the wheel. Clinicians use tried and tested therapies to treat patients, and a designer should pick one therapy to learn about and use as the base of their app. In addition, designers should become familiar with assessments like the PHQ-9, a nine-step questionnaire for depression. Healthcare providers spend years studying and learning the power of their language. Since designers don’t have that experience, we need to learn a few basics. For example: tough love may sound great, but it’s not the right way to speak to people in a digital therapy. In fact, fear of failure stops many people from seeking out treatment. An app that encourages empathy will be far more effective. If the app has a social community, it should have moderators or some other method to make sure the conversations and interactions are positive. If not, focus on the language used to encourage the patient: self-empathy is important too. There are two types of motivation: intrinsic and extrinsic. It’s easy to find examples of extrinsic motivation in apps – it comes in the form of badges, rewards, and most other gamification. While there’s nothing wrong with gamification, it’s not enough to keep someone engaged for more than a few weeks. Instead, to create lasting change add intrinsic motivation. Help users determine what they want to accomplish or how they want to feel. Show them how the actions they’re taking are beneficial. When people feel in control and they recognize how their actions support their values, they become intrinsically motivated. Usability testing is important for all apps, but, if possible, it’s even more important for health-related apps. After all, it doesn’t matter how evidence-based the app is if no one can use it. What’s more, some mental illnesses impact a user’s ability to focus, so usability testing with the target audience can reveal needs that beta testing with other designers does not. The goal of testing should be twofold: to test both the efficacy of the app and the usability. Even the most enjoyable and useful apps have a tough time catching on. One reason for this is that the app is not the most important thing in the user’s life. We as designers must remember that. We need to figure out how our apps fit into the day-to-day life of our user. What motivates them to open the app? What notifies them, and how often? Answering these questions will help us to see our user holistically and design an app that engages them and connects to their needs. But being holistic goes farther. One of the benefits of mental health mobile apps is their ubiquity of access – particularly in the United States where many people struggle to get access to mental health services. And “lack of access” can mean a lot of different things. Designers need to be holistic in their view of the target audience, taking into consideration more than simply diagnosis and treatment. A person’s culture, background, financial position, health literacy, and age can impact their needs and their use of an app. The more a designer can be inclusive and design holistically, the more likely their app will be successful. Not every therapy works for every patient and not every app will be right for every person. But we can – and must – do better for the millions of people who struggle to improve their mental health. 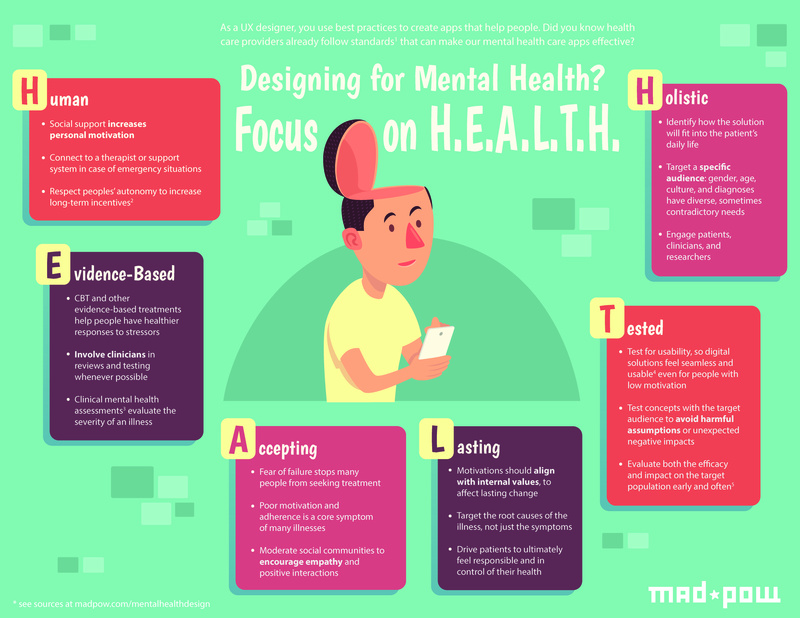 By following the HEALTH guidelines, designers can do more good for patients and providers in the mental health space. Want to learn more? Send Marli an email or find her on Twitter.